"She was very critical of the president’s foreign policy, and basically said ’he doesn’t have one,’" said Romney, the 2012 Republican presidential nominee. "I used to say that during the campaign." Romney was referring to Clinton's interview with the Atlantic's Jeffrey Goldberg, where the former secretary of state appeared to create space with the President on foreign policy and knock some of his guiding principles. "Great nations need organizing principles, and ‘don’t do stupid stuff’ is not an organizing principle,” Clinton said, referring to a view Obama has expressed to aides and reporters. Clinton's split with Obama and the subsequent beltway kerfuffle – where Clinton was knocked by former Obama aides and forced to backtrack – was evidence of how difficult it would be for her to create any distance with the President. "Hillary Clinton tries to distance herself from the foreign policy of the President," Romney said with a laugh in Chicago. "That would work better were she not his secretary of state for four years." Bloomberg was the first to report on the Romney-Ryan event. Romney later added that if Clinton were to win in 2016 – she is the favorite for the Democratic nomination and is admittedly thinking about a run – she would just "keep these things going" like they have been under Obama. Romney made similar statement in a Thursday night appearance with Ryan on Fox News. "I can't begin to explain the President's foreign policy. I think Hillary Clinton tried to explain it by saying there wasn't a foreign policy, in effect," Romney said. "Rarely did I agree with what Hillary Clinton had to say but on that topic, I think we agreed. I think it's interesting that she tries to distance herself from the President's foreign policy, given the fact that she was his secretary of state for four years." The former Massachusetts governor's critique echoes what Ryan and other Republicans have said: Clinton won't be able to shake the Obama record. "I don't think people are going to want to have an Obama third term and no matter how she tries to shake that label, she won't be able to," Ryan said in an interview with USA Today earlier this week. 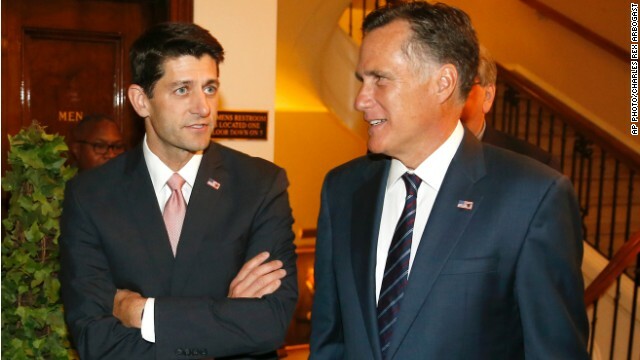 This line of questioning by Romney and Ryan has worried some Democrats. Some Clinton associates have quietly expressed concern that one of the most effective critiques could be that her presidency, should she run and be elected, would be nothing more than Obama's third term. "She was in his government, she was at his side," a Clinton friend and former aide told CNN. "That is, the way to go after her is four more years of the same old thing. The question they should ask her is 'Tell me 10 things that you disagree with him on.'" Not all Democrats, especially those tasked with defending Clinton, agree that the former secretary of state will need to distance herself from Obama. "Hillary Clinton is one of the most admired and trusted public figures in America and should she run for President, she will run on her own record and implement her own vision for moving our country forward," said Adrienne Elrod, spokeswoman of Correct the Record, a pro-Clinton communications group, in response to Ryan's critique. Think again.... It all boils down to this FACT: The gop/tea bags have NOTHING to offer our country except anger, fear, hatred, division and economic, military and foreign policies that are all PROVEN FAILURES. Romney is 1000% correct. the troubles here are a direct result of the Community Organizers foreign policy that Hillary seemed fine implementing with no questions asked. not only has all the progress made been erased but now Hagel said that this threat is something we've never seen before. Obama has created a mess of this Country (the southern boarder, race relations, IRS, obamacare) and the world (ISIS, Syria, Libya, Egypt, Iraq, Afghanistan, Russia, Iran, Benghazi). the failures keep mounting up. Hillary will only keep the ball rolling. What a joke the office of the presidency has become. it seems only used as leverage for a great tee time. At leas Obama has 50% going for him, he's looking older but certainly not wiser. Geronimo. Smith, you do know that since the mid 1960, this country has spent TRILLIONS to help the poor, so how come they are still poor. "If Hillary is elected the world will suffer under Barack 3.0." You can do better than that. How about maybe threatening everyone with Mexican ISIS members bringing ebola over the southern border and then shooting white babies with Fast and Furious guns while passing out joints to grade schoolers? And come on, you guys are clearly slacking on the Benghazi rants. Oh thanks Sniffit for planting the suggestion! Right now I will bet money there is a bunker being dug in Texas somewhere for the new "Secret anti-ISIS ebola Fast Furious baby protectors from the Tea Party Koch spin-off". obama has a foreign policy... speak stupidly and don't do anything. our enemies love it! just ask putin, assad, iran mullahs, libyan terrorists, hamas. I can't understand why some can't get it. President Obama is the best President ever. In anyone's thinking, is it a bad thing to prevent anyone's kid go and die in unnecessary wars? The man has tried very hard to avoid any war. He is the best thinker in my opinion. In Romney's thinking, could he had sent three of his sons or all five to fight in wars, incase he was picked as President in 2012? Talking is an easy thing anyone can do than implementing. Gurgyl, " Is stocks up above 17k wrong" but you HATE corporations. I LOVE MY PRESIDENT, AND STAND PROUDLY BY HIM. did you click your heels and raise your arm in salute when you wrote this? Hillary will WIN because of Obama! The majority of Americans STILL DO NOT want the republicans candidates as president. More like democrats trying to separate themselves from themselves. Kinda like trying to strain water thru water. Dems in red states walking a tight rope. Have fun! The adults in the room refer to this as "differences of opinion" and "individual thought". I know it is hard to lock-step Purity test conservatives to imagine but smart people respectfully disagree at times. Romney is 1000% correct. the troubles here are a direct result of the Community Organizers foreign policy that Hillary seemed fine implementing with no questions asked. not only has all the progress made been erased but now Hagel said that this threat is something we've never seen before. Hagel's correct. It's just taken over a decade for someone in government to admit it. When Bush toppled Saddam in 2003, many Arab states were abuzz with talk like, "Do you know what the U.S. has just let out of the bottle?" They've known about radical Islamists for generations. It's why some of the Middle East governments have always ruled with such a firm hand. They were keeping a tight rein on extremist groups like ISIL. "Romney is 1000% correct. the troubles here are a direct result of the Community Organizers foreign policy that Hillary seemed fine implementing with no questions asked. not only has all the progress made been erased but now Hagel said that this threat is something we've never seen before. Obama has created a mess of this Country (the southern boarder, race relations, IRS, obamacare) and the world (ISIS, Syria, Libya, Egypt, Iraq, Afghanistan, Russia, Iran, Benghazi). the failures keep mounting up. Hillary will only keep the ball rolling. What a joke the office of the presidency has become. it seems only used as leverage for a great tee time. At leas Obama has 50% going for him, he's looking older but certainly not wiser." What kind of dressing do you prefer on your talking point word salad? Clinton already exposed what alot of us know with regards to the split. However, I don`t think she was expecting the backlash from progressives, liberals zealots, and the liberal media. The closer it gets to 2016 the gap will increase. Sorry Mitt, better think of a new plan. --Lizzie, in six years, at least the law called, ACA Law passed. It is saving you from denying insurance from Greed. What did GOP do? Send you to Iraq war to drain and kill? Nonsense. Yes, today stocks soaring. The altar boy whose family was helped by the same social services he now wants to deny others and is not good at pretending to clean already cleaned pots at a soup kitchen cannot distance himself from a failed second try by the twit for the presidency. Stick to those dumb bells dummy. This guy didn't move the scale one bit when plucked from the list of losers the teaklans had. Heard him onTV this morning about three times is the charm speaking to the twit, or something like that. I tend to pretend these two never happened like 51%of the US who were smart enough not to vote for them. I don't know about clicking heels but having been in the military, I can tell you it is proper to salute your Commander in Chief. I would rather have people saluting than the Tea Party raising weapons threatening violence and overthrow. Sounds like you could use a trip through Army basic training to learn how and who to salute. And Mr. Romney will never be able to distance himself for his infamous "47 percent" remarks! 10 things she disagrees with him on??? Yeah right, like that is going to happen. She was Obama's errand girl for 4 years selling his warped and defective world view. Her and Obama are tied at the hip. If she attacks Obama, she can kiss the black vote good bye as well a lot of the Progressives. Hillary has painted herself into a losing corner. The poverty rate has dropped from nearly 24% to 16%. It's working. Where do you think the ultra-rich are getting their wealth from? There are more people with disposable income, that's where. That's all they've got is prayer, as they have NO solutions, NO platform, and to date NO viable candidate. Oh thanks Sniffit for planting the suggestion! Right now I will bet money there is a bunker being dug in Texas somewhere for the new “Secret anti-ISIS ebola Fast Furious baby protectors from the Tea Party Koch spin-off”.